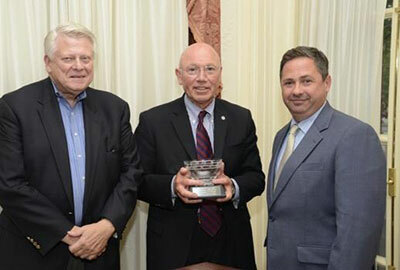 Indiana University Lilly Family School of Philanthropy founding dean Gene Tempel receives the David R. Jones Award. Each year The Fund for American Studies bestows the David R. Jones Leadership in Philanthropy Award to recognize outstanding individuals who promote the American traditions of philanthropy, free-enterprise and individual responsibility. The award's namesake, David Jones, was a co-founder and longtime president of TFAS. Jones had a distinguished career as a teacher, political organizer, campaign director, chief of staff to a US Senator, and non-profit executive. One of the best parts of my job is the time I get to spend with passionate, dedicated students like you who are actively making a difference in the world. It’s exciting and inspiring to hear about the important work that you are doing through your internships this summer, on your campuses and in the surrounding communities, and what you have accomplished in your hometowns. Your accomplishments and contributions to the world are impressive. I congratulate you on all you are doing to make the world better for others. Accomplishments like yours and the desire to make an effective difference are among the reasons that The Fund for American Studies and what was then the Center on Philanthropy at Indiana University, now the Indiana University Lilly Family School of Philanthropy partnered to create the Institute on Philanthropy and Voluntary Service 15 years ago this summer. As you have no doubt discovered, philanthropy and the nonprofit sector are complex, dynamic and ever-changing. While it has been argued that philanthropy is a uniquely American tradition, there is strong evidence that, when counted broadly, philanthropy is ubiquitous across societies, cultures and generations. It is an engine for social change as well as a stabilizing force to maintain existing social and economic structures. Philanthropy is growing not only in size, but also in complexity. There is an increased, sector-wide call for transparency and accountability, and it takes educated leaders to deal with these complexities. Today, forms of philanthropy are complicated. Terms like venture philanthropy and social entrepreneurship don’t always mean the same thing. These terms can refer to nonprofits that use business principles or nonprofits with for-profit subsidiaries or for-profit businesses with philanthropic missions. "What if I could make my passion become my profession?" "Philanthropy can be a grand experiment"
These are extraordinary times in the philanthropic and nonprofit sector. The Great Recession and an aging population are forcing governments at all levels to reduce spending. The nonprofit sector needs to determine the most effective response. These challenges call for extraordinary efforts by the university community to understand the traditional roles the sector has played, the dynamics of the changes taking place, and the potential for continued growth even as the environment becomes increasingly complex. The needs are great and the differences are great. Now, there is a call for philanthropy to ameliorate these differences. The opportunities and challenges are great. A key tenet of philanthropy is that philanthropy is the right of any person to try a new idea or a new approach to solving a problem or making a difference. Philanthropy can be a grand experiment to help others. Like all experiments, some succeed and others fail, but we learn from each attempt. As you return to your campuses and move ahead in your education and your careers, I urge you not to be afraid to try, to experiment — and to fail as you improve philanthropy to improve others’ lives. Be thoughtful and reflective, work hard and experiment. Through that process great leaders improve organizations, lives and communities. That is how you will best apply your education and your experiences here going forward, and I hope that is at the core of what you take with you when you leave here. Nonprofits and foundations constitute about 10 percent of the U.S. workforce. As the sector continues to expand and more Baby Boomers retire, there is a growing need for thousands and thousands of new leaders. And given the complex philanthropic sector, more than ever before, people willing to give their time and talents to others need more sophisticated knowledge and preparation to achieve their mission and make their impact meaningful and lasting. I imagine your experiences this summer have helped shape your ideas of how you want to serve in the future. As you consider your next steps, I encourage you to think about graduate education that will prepare you for careers of service, and I invite you to explore the opportunities available to you at the Indiana University Lilly Family School of Philanthropy. Our graduates are reflective, insightful leaders prepared to anticipate and address new opportunities and challenges as they arise in the rapidly changing philanthropic sector. In remarks at our commencement reception, Tyrone Freeman, one of our Ph.D. alumni who is also our director of undergraduate programs, described the opportunities he and other students experience. “The Lilly Family School of Philanthropy … is unique. It allows us to develop and live out what the writer David Brooks calls the resume virtues and the eulogy virtues. He says the resume virtues are the skills we bring to the marketplace and what we put on our resumes. The eulogy virtues are deeper, more meaningful, and get mentioned in our eulogies. Because society favors the resume virtues, we neglect the eulogy virtues at great expense. "You will improve the world in ways we cannot yet even imagine"
You will use the education, experiences and affiliations you gained here at the institute to contribute to the world in specific, consequential and immediate ways, and throughout your lifetime. Maybe some of you will become fundraisers who, as The Fund Raising School’s founder Hank Rosso, teach “the gentle art of the joy of giving” and build the movement toward growing the overall amount of charitable giving. Sara Konrath, our newest faculty member, has done research on the impact of giving and volunteering on our health and longevity … and guess what – it’s positive. Maybe some of you will join foundations or other grant-making organizations and serve as stewards of funds that change lives – a very serious responsibility. Others may join nonprofits that identify and implement solutions for thorny social problems, seeking out new ventures in social justice and human rights, health care, the arts, or youth or veterans’ programs, education and more. You will improve the world in ways we cannot yet even imagine. And so, I ask again, what would it mean for you to make your passion your profession? Thank you again for this significant honor and for the chance to be with you today.